There has been a settlement in North Nibley from Saxon times if not before. 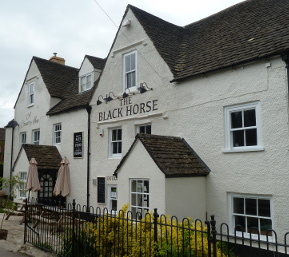 We are lucky to have a legacy of historic buildings in the village some dating back to the fifteenth century. Some of these are listed by English Heritage. The fifteenth Century church is dedicated to the 5th century Saint Martin who served as a Roman soldier and later became Bishop of Tours. 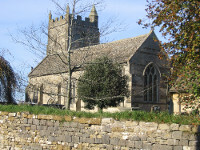 The church is thought to have been built on the site of an earlier Saxon church and was extensively restored in Victorian times. It's prominent position overlooking the Berkeley Vale suggests that the site may have earlier religious or ceremonial importance. It was built in honour of William Tyndale, a translator of the New Testament, who is believed to have been born at North Nibley. 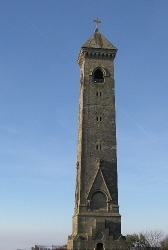 The tower was constructed in 1866 and is 111 ft (34 m) tall. It is possible to enter and climb to the top of the tower, up a spiral staircase of about 120 steps. Tyndale's English translation of the New Testament was taken almost word for word into the much praised Authorised Version (King James Bible) of 1611, which also reproduces a great deal of his Old Testament. The architect of the monument was Mr. S.S. Teulon, of Charing Cross. The ceremony of opening the tower was performed by the Earl of Ducie, Lord Lieutenant of Gloucestershire. Former manorial house or priest's house. Coursed rubble marlstone with limestone ashlar dressings; rubble chimneys; stone slate roof. 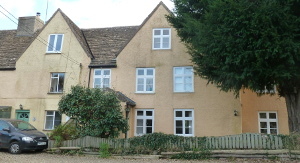 Two-storey; projecting 2-storey rear wing with cellar. Front: scattered fenestration of various dates, mostly resulting from 1853 restoration. Off-centre moulded 4-centred arched doorway with quatrefoils in spandrels and bold hoodmould with shield stops; pointed-arched former staircase window over with C14 style tracery and small parapet gable above. At extreme left-hand end large blocked C15 moulded 4-centred arched opening, probably original entrance; fragment of moulded string course above. Parapet gable at each end of building Interior has large moulded Tudor-arched stone fireplace in hall, possibly late C15. Roof is 5-bay arched braced collar-truss type, mostly concealed by present ceiling, with moulding on inner edge of bracing pegged to principal rafters. Upper floor is probably an insertion. Called The Chantry since C16, but position suggests a manorial use, or possibly a use as a priest's house. 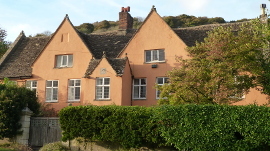 In early C19 was used as a school house. Large country house. Mid C17; late C17 alterations; major alterations of 1763 for George Smyth; late C19 or early C20 additions. 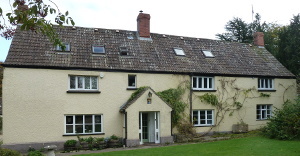 Ashlar limestone; roughcast to rear elevations; ashlar chimneys; plain tile roof. Two-storey with attic and cellar. Central staircase plan with wing to rear. Front: 2:3:2 fenestration, 15-pane sashes to ground floor and 12-pane to upper floor all with moulded eared architraves and bracketed sills. Central doorway with Gibbs surround has 6-panel door with rectangular light over. Interior is mostly of 1763 except for some rear areas. Finely proportioned room with mid C18 marble fireplace. High square hall with open well staircase on 3 sides having 3 turned balusters per tread and wreathed handrails. Room in north-west corner has fine Rococo plaster ceiling with flowers and fruits depicted with great realism. In angle with rear wing a late C17 or early C18 staircase with moulded handrail and barleysugar balusters. Some late C17 timber framed partitions in older part of house. Roof structure incorporates part of C17 roof. Some alterations may have taken place between the building recorded by Kip and the major rebuilding of 1763. The present house is as engraved by Bonner in 1779. Detached country house. c1840, but considerably rebuilt in 1880, following a fire. 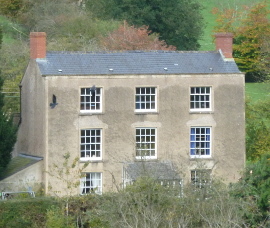 Limestone ashlar, Welsh slate low pitched hipped roof to main block, squared and dressed limestone in principal wing and attached out-buildings. Compact main block in two parts, parallel range, with three related buildings forming rectangular courtyard to west. Courtyard completed by one-storey detached block to west, and two storey, parallel range carriage house with wide flat elliptical opening, to north. The Grade One Temple and Folly Gardens have been described as being of similar calibre as Stourhead in Wiltshire and of Biddulph Grange in Staffordshire. The garden was the inspiration of the reverend David Purnell-Edwards who was married to a portly lady and, as legend has it, he embarked on the idea of a idealized walk which would encapsulate all the important civilizations around the two acre lake; made up of The Chinese, Egyptian and Greek architectural styles. He devised a series of tunnels to reach the garden which were to be too narrow for his broad wife to pass through. With a team of soldiers back from the Napoleonic Wars, the reverend designed a walk which circled the lake to lead to a small temple which he created for his love trysts with a local gypsy girl. Detached house. Late C18; mid C19 addition. Roughcast on random rubble marlstone; coursed rubble limestone to rear wing; brick chimney; stone slate roof. Two-storey with attic; 2-storey rear wing to form L-plan; lean-to additions in angle and at south end. Front: 2-window fenestration, all original leaded casements with timber mullions in segmental-arched openings. Doorway to right has flat timber porch hood on brackets and plank door. Interior: many original fittings. 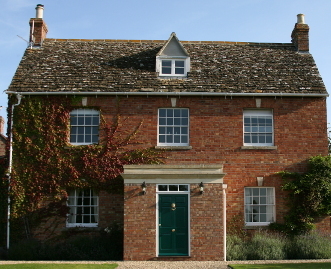 Main casements have panelled shutters. Original front door with contemporary ironmongery. Rear wing formerly contained cider mill. Detached house. Late C17; refronted c1830. Roughcast render on random rubble limestone; ashlar chimneys; stone slate roof. Two-storey with attic; 2-storey rear wing to form L-plan with staircase projection in angle. Front: 4-window fenestration. Mixture of 12 and 16-pane sashes, 16-pane being to right of off-centre doorway with plain beaded surround and moulded cornice; 6-panel fielded door with Gothick glazing bars in rectangular light over. Plain pilaster strips at ends of facade. Moulded stone parapet cornice. Four hipped attic roof dormers with leaded casements. Ridge-mounted chimneys with plain caps and skirts at gable ends of front range. Rear: wing projects to right with projecting gable end chimney stack. Single 12-pane sash to upper floor of wing, and 12-pane sash to staircase projection having catslide roof. Rear of main range has continuous single-storey lean-to; single hipped attic roof dormer. Former inn, now detached house. Partially C15; mostly C18 with C19 additions. Random rubble limestone, formerly with C18 roughcast render; brick chimneys; plain tile, pantile and Welsh slate roofs. Two-storey with cellar; 2-storey with attic south wing forms L-plan, with single-storey addition in angle. Stone quoins and quality of masonry indicate earlier origins for this part of the building. Interior said to contain medieval fireplace. A building of considerable historic interest as it formed the first inn on the medieval route from Berkeley Castle to London, and was initially built for this purpose. House with attached former mill, now private guest house. 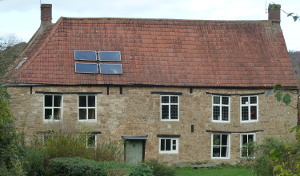 C17 or early C18 mill, altered in early C19; C20 alterations. House of c1820. House: 2-storey with attic. Mill: 3-storey with single-storey rear outshut. Mill to right is of 2 building periods. Oldest part to left. Large stone quoins mark junction with later enlargement. right end a pointed-arched window, possibly former doorway. Detached farmhouse. Dated 1812. Flemish bond red brick. Two-storey with attic; 2 rear wings to form U-plan. Central upper floor keystone inscribed 'JJS/1812'. Brick gable end chimneys. Rear: wings have scattered segmental-arched casement fenestration. Many internal walls said to be stone, possibly surviving from former house on this site. Formerly 2 barns, now barn and attached house. Mid C18. Random rubble marlstone with limestone quoins. Six-bay barn with porch on east side; 2-storey house. Large brick segmental arch to barn doorway with small keystone. Interior of barn has 6-bay collar and tie-beam truss roof. Segmental-arched opening between barn and east porch. Detached farmhouse. 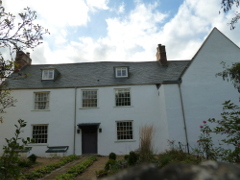 Late C16; extension dated 1660; early C19 alterations. Roughcast rendered front, painted marlstone rubble elsewhere; brick chimneys; plain tile roof. Two-storey with attic. Wing at north end; central stair wing to rear. South end: gable end with off-centre blocked ground floor window with hoodmould has datestone 1660 possibly reset from elsewhere on building and now partially obscured by attached conservatory. Projecting chimney stack on north side of wing. Two gables to elevation of main range to left each with single-window casement fenestration, altered on ground floor with C19 and C20 lean-to additions. Right gable has leaded attic casement with hoodmould and further hoodmould to opening below. Interior: mostly indicates late C16 origin. Elizabethan dog-leg staircase with polygonal finials to newels and splat balusters rises to attic level. Room at south end appears to be addition, possibly of 1660. Indications of former spiral staircase within turret on east front. Said to have been house of William Archard, clerk to John Smyth in about 1600, Smyth being surveyor to the Lords of Berkeley. [Recently renovated to a high standard restoring many of early features.] Dovecote stands to north-west (also listed). Detached farmhouse. C17, extensively rebuilt c1800. Roughcast front, random rubble marlstone and limestone to sides and rear. Two-storey with attic; rear outshut and single-storey with attic rear wing form L-plan. Interior has late C17 staircase with turned balusters. Forms part of group with barn to south west. Detached house. 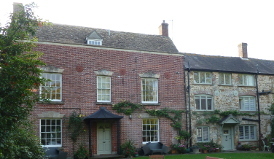 Mid C18; refronted c1820; C19 and C20 alterations. Stucco; random rubble limestone and marlstone. Two-storey with attic; two 2-storey rear wings to form U-plan. Rear: 2 wings either side of recessed centre. Many additions in C19, possibly when house was divided into 2 occupations. Interior has simple early C19 staircase with stick balusters. Detached farmhouse. c1830. Flemish bond red brick; coursed rubble limestone to sides and rear; brick chimneys; stone slate roof. Two-storey with attic. Central lean-to porch with 16-pane sash on front and 4-panel door in west side. Central gabled roof dormer. Brick ridge-mounted chimneys at gable ends. Detached house. Late C16; late C17 alterations. Roughcast on limestone rubble; ashlar copings; brick chimneys; stone slate roof. Two-storey with attic and cellar. L-plan with addition in angle. Two-storey front porch. Front: central porch has gable with ball finial on front and sides, leaded cross window over and stone sundial plaque in gable. Oval window in each side wall of porch. Large parapet gable with ball finial either side of porch, right has leaded attic casement. Interior: fine late C17 staircase with barleysugar balusters. Plaster ceiling of staircase hall depicts sun, moon and stars and has central wreath with delicate petal decoration. Bar stops to most beams. Lofty attic with extended collar roof. House stands behind late C17 garden wall with gatepiers (also listed). Farmhouse, now house. C16 or earlier, much remodelled and extended in late C17. Coursed limestone rubble, roughcast to front, with pantile roof and brick stacks. 3-unit plan with end stacks and axial hall stack backing onto through passage (blocked to rear); late C17 wing to rear right built to rear of parlour and making L-plan; stair outshut at angle with rear wing. 2 storeys. 3-window front has mid C20 porch and 3-4-light windows. Right-hand gable has C17 two-light wood-mullioned stair window and a large chamfered lintel over a chamfered 2-light wood- mullioned first-floor window. Rear elevation has chamfered surround to small window to rear of hall stack. Rear wing has C19 rear lean-to with plank door and pantile roof. Interior: chamfered ogee-stopped and ovolo-moulded beams throughout. First-floor room to left has morticed soffits to cross beam and two axial beams indicating position of former closet. Timber- framed partitions to first floor on right, the right-hand first- floor room having a rare surviving example of a newel stair made of solid timber-treads. Roof: 3 C18 trusses to left of stack with tusk tenoned purlins, the service end rear wall having been rebuilt; adjoining right side of stack is an early C17/late C16 collar truss with trenched principals, and 2 bays with a cambered collar to central trusses; C17 oak-framed doorway with chamfered arched surround leads from this range into right-hand section of roof, which appears to have continued to form a cross-wing gable to front; 2 late C17 trusses with tenoned purlins and threaded ridge. 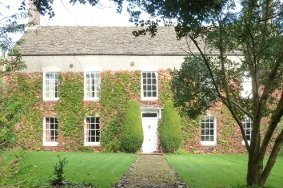 The right-hand ground-floor section of the house retains an oak- framed chamfered, 2-centred doorway of late medieval type; panelled parlour of c1730-40 with dentilled cornice, panelled doors, later graffiti date of 1781 and fine overmantle painting depicting hunting scene flanked by fluted pilasters with Doric entablature; C18 surround fronts C17 fireplace with stop- chamfered bressummer. Detached house. Late C17. Rubble faced in roughcast render; artificial stone chimneys; stone slate roof. Two-storey with attic. Front: 2 gables; scattered fenestration, mostly C19 casements except for leaded cross window at right-hand end. Doorway roughly central with flat timber porch hood and 4-panel door. Attached single-storey outbuilding at left-hand end has east facing casement. East end: marl stone rubble; single-window fenestration, C19 casements with brick segmental arches. C19 attic casement with timber lintel. Rear of building not accessible at time of survey (September 1985). Interior not accessible but showing little signs of alteration. Detached house. c1820. Roughcast; random rubble limestone to outshut; brick chimneys; Welsh slate roof. Three-storey; 2- storey rear outshut. Front: 3-window sash fenestration 16-pane to ground and middle floors, 12-pane to upper floor. Central pedimented doorway with reeded architraves and 6-panel door; attached lean-to conservatory porch. Moulded stone parapet cornice. Brick gable end chimneys. Rear: outshut faces onto road. Off-centre doorway with C19 canted oriel over. Casement fenestration to left. Interior not inspected; front sashes retain panelled shutters. Formerly farmhouse, now detached house. Late C17; C18 addition. Random rubble marlstone; brick chimneys; clay pantile roof, formerly thatched. Two-storey with attic; L-plan; single-storey with attic addition to return. Front: 5-window fenestration. All C19 casements to ground floor except for central timber mullioned casement; central and right windows to upper floor are leaded cross windows, 2 to left being C19 casements. Outer windows are paired with single timber lintel. Off-centre doorway with timber lintel and C19 plank door sheltered by gabled enclosed porch addition. West side: roof hipped at right-hand end. Single- window fenestration: 5-light timber mullioned fixed light to ground and upper floor with replacement concrete lintels. Two small-paned casements in extension to left; hipped-roofed single- storey C20 extension beyond. 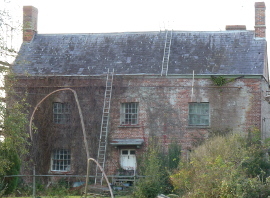 Rear: gable end of return to right with high coped parapet; attached outbuildng has brick gable end chimney stack and small-paned casement on east side. Scattered fenestration to rear of main block: iron ground floor casement to left; doorway to right sheltered by lean-to conservatory has heavy timber frame with 3-centred arched head and plank door. Central timber-mullioned 3-light leaded staircase window; upper floor timber mullioned casement to left and leaded cross window to right, all with timber lintels. Interior has many surviving features of late C17. Timber framed partitions have chamfered framing members to square panels. Chamfered beams have pointed bar stops with small cut-out enrichments. Contemporary staircase with turned balusters. Room on upper floor has doorway with original plank door complete with original decorated strap hinges. Roof largely rebuilt in C20, probably when thatch was removed. Remarkably unaltered except for roof. Former farmhouse, now detached house. Late C17. Random rubble marlstone; brick chimneys; stone slate roof. Two storey with attic; L-plan. Front: scattered and mixed fenestration. Large gabled glazed porch addition at centre with small leaded casement over, and small-paned casement to right, both with timber lintels. To left, ground floor 2 + 2-light chamfered stone-mullioned casement with central king mullion and hoodmould; 3-light stone- mullioned casement over. 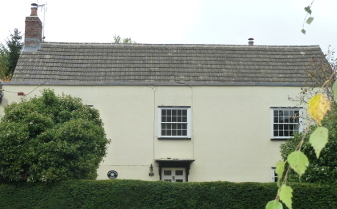 At right-hand end small-paned casement with similar over, both with timber lintels. East side: gable end of main range to left flush with rear wing projecting to right. Off-centre attic casement in gable; single small-paned casement on ground and upper floors of wing, both with timber lintels. Brick gable end chimney stack. 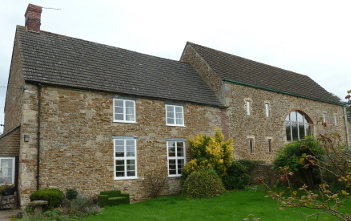 Rear: gable end of wing projects to left, having blocked doorway and off-centre casements. Elevation to right has lean-to conservatory addition; 3-light stone- mullioned upper floor casement; other timber casements. Brick gable end chimney stack to west end. Interior not inspected. Coaching inn. Early C18; extensive early C19 additions; C20 alterations. Roughcast render to front and sides, coursed limestone rubble to rear; ashlar limestone and brick chimneys; stone slate roof. Long 2-storey range with attic; 2-storey block at rear. Front: 3 gables with mixed fenestration, generally single-window to attic in gables and 2-window below. Sashes are mix of early Cl9 6-pane and later C19 4-pane; some C20 small-paned casements. Central gable has long hoodmould to upper floor and hoodmould to attic sash in gable. Single attic sash in left gable also has hoodmould in imitation of the others. Two C20 gabled porches toward centre of elevation. Single ridge-mounted brick chimney between centre and right gables. Tall ridge-mounted ashlar chimneys with left-hand gable between indicate extent of early C19 addition to this range. Rear: parallel-roofed early C19 addition with segmental-arched casement fenestration. To right of this full attic gable to rear of main range. Building stands at focal point of central village cross-roads.